Suitable for all hard metal tubes with an outer diameter of 12mm. On the other side of the connector it is as usual the ¼ "thread. Available in Deep Black and Chrome. First, we put the union nut onto the tube, this is followed by a plastic disc which protects the O-ring and thick O ring itself. Now the tube is easily inserted into the connector in the already the second O-ring is seated rests very close to the tube. As a final step, the union nut is pushed and screwed on the connection. 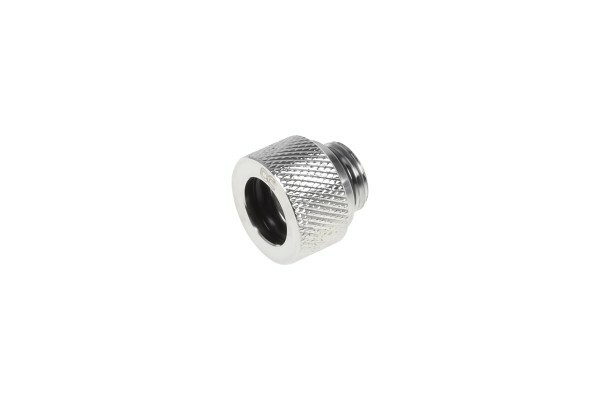 The bottom of the compression fitting can be easily tightened by using an 8mm Allen key. Was hat es damit auf sich, dass diese Anschlüsse in der Kategorie 13/10mm eingeordnet sind aber laut Beschreibung eigentlich 12/10mm haben sollen? Wir haben lediglich keine Kategorie für 12mm angelegt da es in dieser Größe nur wenige Anschlüsse gibt. Daher sind diese Anschlüsse hier eingepflegt.